Some of the Word Sudoku puzzles I've lined up for today and next week are not one word--I think. To be completely honest, I don't know! Is TOUCHPADS one word? I think so! And I believe KING COBRA is two words. But how about YACHTROPE? One or two? 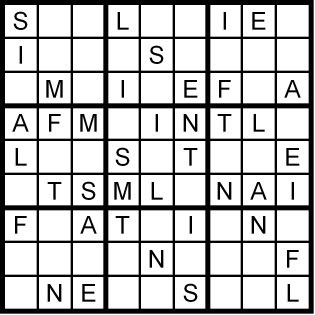 Well, each contains nine letters, so each is a Word Sudoku puzzle for you today and a few days next week! 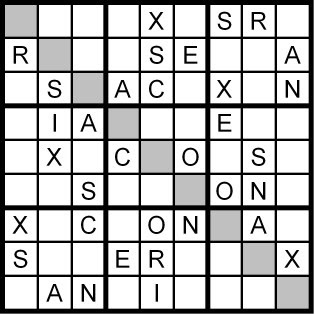 Today's puzzle is the standard, or 'classic' 9x9 (3x3 internal squares) grid, with no hidden words or diagonals to twist you! Happy solving! Come by tomorrow for the Sunday Challenge--a 12x12! 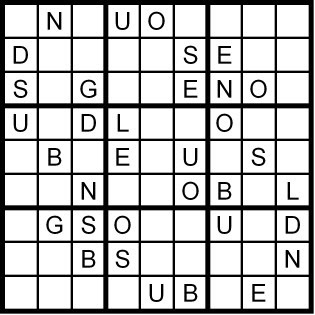 A new Word Sudoku puzzle will come your way later this morning. I'll publish the solution first thing tomorrow morning, Pacific time (Saturday), and I'll publish a new puzzle for you later in the day. And be sure to drop by Sunday morning, when I ask you to solve my Sunday Challenge--a 12x12 (3x4 internal rectangles) Hidden Word Sudoku! It'll stretch those "thinking abs" a different direction, if you've been imbibing only 9x9 (3x3 internal squares) Sudoku! This puzzle, ONSLAUGHT, was reasonably simple--not a normal newspaper's "4-star Thursday" puzzle. In fact, most of the puzzles I'm showing you on this blog are the equivalent of 1- or 2-star, on purpose. I can make really hard ones, but only the best solvers can solve them--and I readily admit, that does NOT include me! I want EVERYONE to get some fun out of these puzzles, so I'm making them on the easier side. 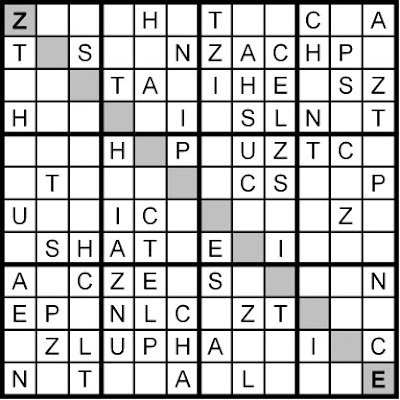 The very fact that each puzzle has a different set of symbols makes each puzzle a BIT harder--instead of looking at a particular cell in the grid and running through the numbers 1-9, you have to spell out whatever word, phrase or anagram you've been supplied with the specific puzzle--the process of filtering possibilities is no longer generic from puzzle to puzzle, but SPECIFIC to EACH puzzle. A new puzzle for you coming later today. I've spent three days in training, so I'm TIRED! 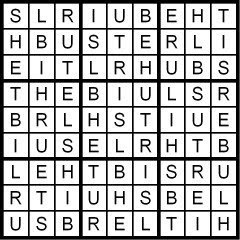 Only one puzzle for you today. Hope you enjoy! ...tougher than a 12x12, but easier than a 16x16! 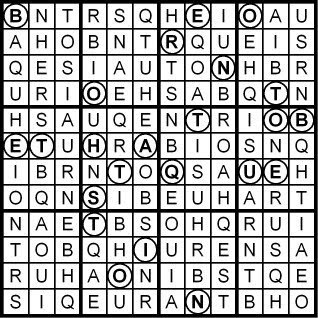 And now, the 14x14 Hidden Word Sudoku puzzle I hope you've been waiting for. The anagram is KID WHAT CONQUER--not quite English, but who cares? I hope you enjoy it. Remember the 'trick' with 2 columns: whatever set of symbols is in the lower half of one column MUST be the same set of symbols in the upper half of the other 'paired' column, where the pair of columns comprises two stacked rectangles. 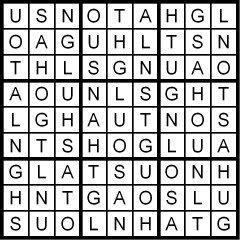 Later today, in addition to the daily classic Word Sudoku puzzle, I'll show you that 14x14 Hidden Word Sudoku puzzle, as promised. Here's your daily Word Sudoku puzzle, courtesy Dave--an amateur puzzle hobbyist. 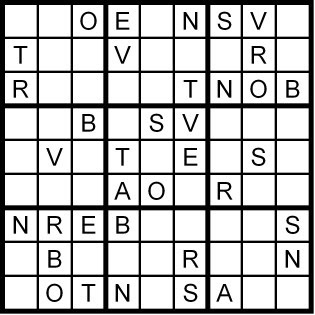 I enjoy constructing puzzles, and I've compiled a collection of variants of Word Sudoku puzzles, including 8x8 (2x4 internal rectangles), 9x9 (the usual 3x3 internal squares), 10x10 (2x5), 12x12 (either 2x6 or 3x4, but 3x4 is more fun), 14x14 (2x7), 15x15 (3x5) and 16x16 (4x4, because 2x8 is too much of a good thing). Of course, I can make larger ones, but I feel they get too hard to complete correctly in a reasonable amount of time, so aren't as much fun. 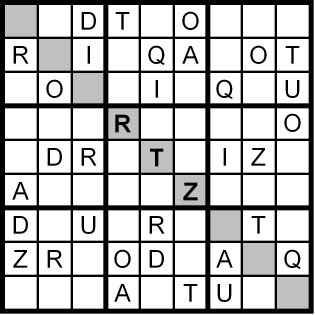 The larger ones, above 12x12, are often tied to complete quotes, where the Word Sudoku puzzle provides the key letters to the much longer (50 or even 100-letter) quote. But I have some cute 8x8 key-to-quote Word Sudoku puzzles. I'll share one of the small ones some day soon. And I'll give you a 14x14 Hidden Word Sudoku puzzle tomorrow! 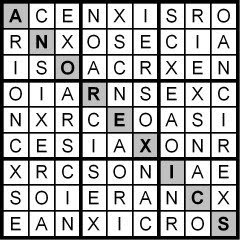 The Hidden Word Sudoku puzzle, RICE AXONS, might have been a bit tougher. And you undoubtedly grimaced rather than grinned when you realized there *was* an ever-so-tenuous clue buried in the anagram of the solution, ANOREXICS. I'd say "Sorry," but I'm not! It's supposed to be that way! Sorry! 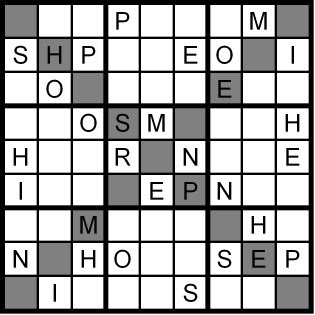 Another classic Word Sudoku puzzle coming your way later today. And tomorrow, I'll show you that 14x14 puzzle...it's easier than it looks! 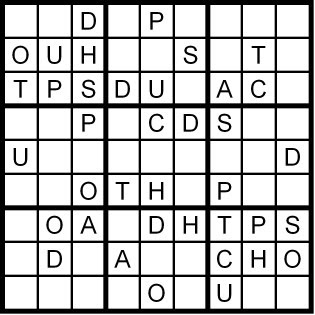 I give you a 'classic' 9x9 Sudoku puzzle to solve (but not publish yourself--these are copyrighted!) every day--but the puzzles are Word Sudoku, using the letters of a 9-letter word, not the numbers 1-9. 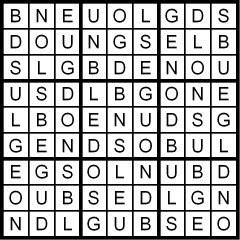 Every once in a while, I like to give you a "little somethin' else"--a variant that extends the classic puzzle. 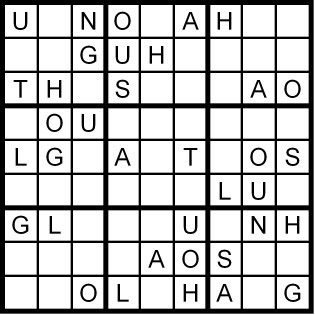 Today I'm including a 9x9 Hidden Word Sudoku, where I give you the letters of the hidden word or phrase, but rearranged in an anagram; as you solve the Sudoku using the normal rule, you spell out the hidden word (usually down or up one of the diagonals). The anagram sometimes provides a very obscure clue. But you won't know it until you solve it, and then you'll either grin or grimace as you get the play on words. Later this week (Wednesday, I think), I'll show you a 14x14 (2x7 internal rectangles) Hidden Word Sudoku: a mid-week challenge! The classic, OBSERVANT, was still pretty easy! The "difficulty level" is pretty hard to measure--if there's a standard, I don't know it--but Crossword Compiler measures it as easy, "requiring only single-symbol logic." The Sunday Challenge, LAZIEST PUNCH (aka ZINC SULPHATE), was a bit harder--but nowhere near as tough as the 16x16 in the newspapers. Thinking of cross-hatching in a serires of columns or rows spanning 3x4 rectangles, rather than 3x3 squares, *does* take some practice...and don't forget to use the fact that all the letters are also contained exactly once down the diagonal! 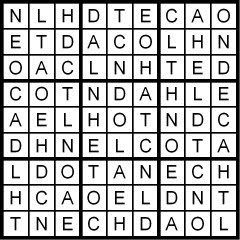 Later today, I'll give you both the daily Classic Word Sudoku puzzle and a 9x9 Hidden Word Sudoku puzzle I hope you'll enjoy. And on some days (really, as I feel like it! 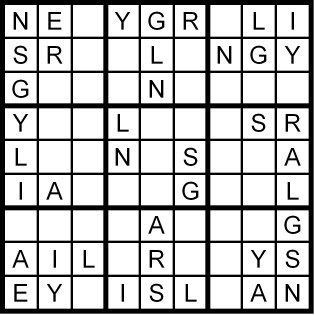 ), I include more Word Sudoku puzzles, often of varying sizes, for the fun of it! 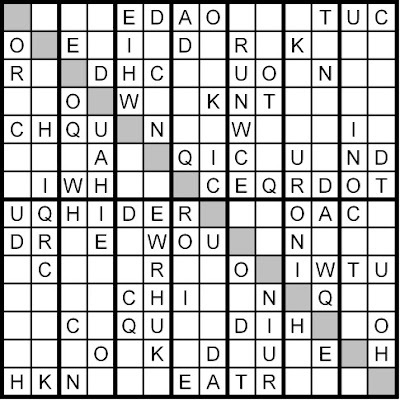 Today's Sunday, and many newspapers provide us puzzlers a larger, more difficult challenge on this day, in both the crossword (instead of the weekday-sized 15x15, Sunday's crosswords are 21x21 or even 23x23) and the Sudoku (The Oregonian, my hometown paper, includes a 16x16 "Monster Sudoku." And it is!). So I think you'll like the "Sunday Challenge" I'm giving you today. 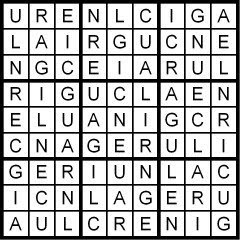 Please let me know what you think of these puzzles. I do this for a hobby, with the hope of eventually publishing a collection. I'd love your feedback. 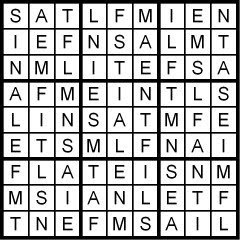 The classic Word Sudoku puzzle, FILAMENTS, was easy, wasn't it? 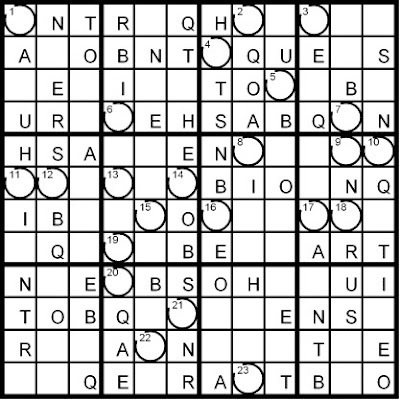 The diagonal Word Sudoku puzzle, MORPHINES, required you to include the diagonals, but that actually gives you MORE information! Once you realize that, filling in the letters speeds up. 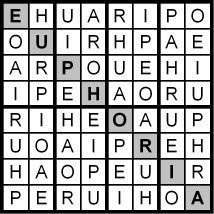 As you thought about how to solve the 8x8 hidden Word Sudoku puzzle OH UP I ARE (EUPHORIA), you probably quickly realized that when internal grouping are only 2 columns wide, you have ENORMOUS information! Study the solution above: Whatever set of symbols is in the lower half of one column MUST be the same set of symbols in the upper half of the opposite column. That realization makes 2-column Sudoku puzzles a lot easier. 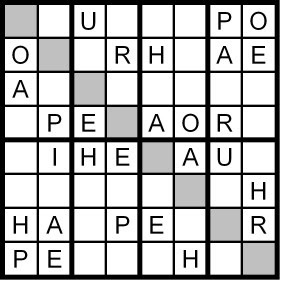 In later posts, I'll show you some 2x7 Word Sudoku Puzzles (that act as keys to phrases you have to figure out) that are quite fun--or, at least, *I* think so! 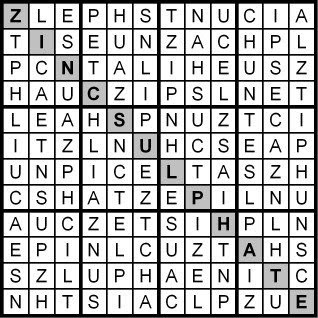 New puzzles will be posted later today, including a "Sunday Challenge"--a 12x12 Hidden Word Sudoku puzzle (with 3x4 internal rectangles)! I'm also including a few additional Word Sudoku puzzles. 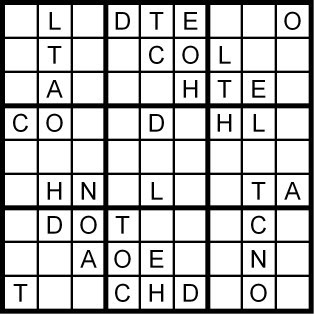 The second one is a diagonal Word Sudoku puzzle, where the rule is rewritten to include the diagonals. 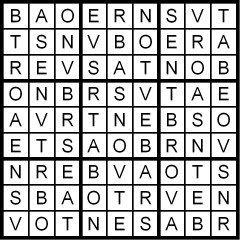 The third one is an 8x8 (2x4 internal rectangles) Hidden Word Sudoku puzzle--I give you the 8 letters in an anagram; you discover the word or phrase spelled down the diagonal as you solve the Word Sudoku puzzle. Have fun! And please let me know what you think. I haven't yet convinced any publisher that these would sell; I have a couple of books of them ready to be published, and your comments will help me produce better puzzles! New puzzles poster later today...please let me know what you think! Hi. Thanks for taking the time to look this over. 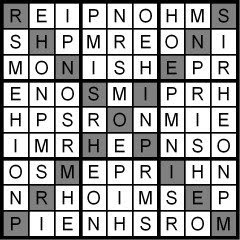 You'll find Word Sudoku puzzles here. I would have named this blog something with the word "Sudoku" in it, since the puzzles I'm placing here are Sudoku puzzles; but while the puzzle form itself isn't protected, that *name* "Sudoku" is--it's a trademark of puzzle publisher Nikoli Co., Ltd. in Japan, a fine company, with geniuses for employees, who apparently get to sit around all day and make up fabulous (and sometimes pretty darn difficult!) puzzles--wow. "Fill in the allowed symbols (usually the digits 1-9) so that each row, column and outlined 3x3 square contains each symbol exactly once." But some people mistake these fun, addicting logic puzzles for MATH: after all, you have to use numbers! Let me offer you proof of the opposite. 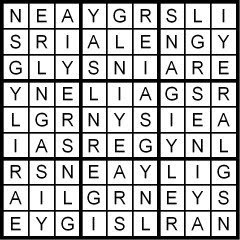 I intend to "publish" one (or more, if the mood hits me) "Word Sudoku" puzzle here each day, and the answer the next day. While the puzzles are copyrighted, I grant you the right to print and complete--but not to publish them yourself; it's *my* intellectual property going into creating the word lists (I have 10,000 nine-letter words on my list right now) and making the puzzles. 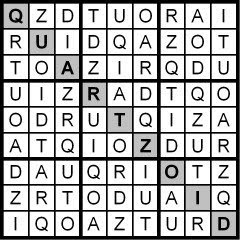 Use the letters in the anagram DO ART QUIZ to fill in the cells in the puzzle grid using the one and only rule: each row, column and outlined 3x3 square contains each letter exactly once. The hidden word of phrase will be spelled down the diagonal. 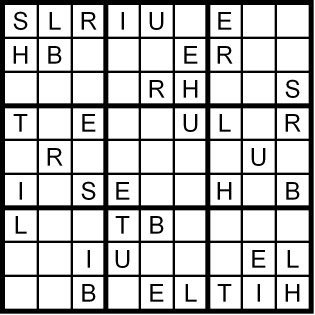 I also have created some hopefully fun variations, including what I call "Hidden Word Sudoku" puzzles: I give you the letters, arranged as an anagram; as you complete the puzzle using the one and only rule, you"discover" the hidden word or phrase, usually spelled down the diagonal. 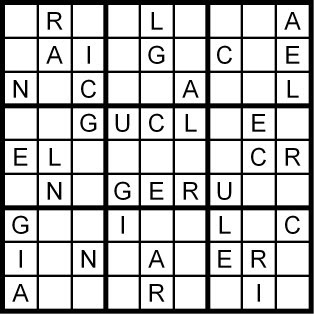 OR nine letters are circled in the puzzle; once you figure out which letter goes where, you can complete another grid containing a full hidden quote. It sounds way more complicated than it is--you'll see, I'm publishing one of *those* right away to whet your appetite. 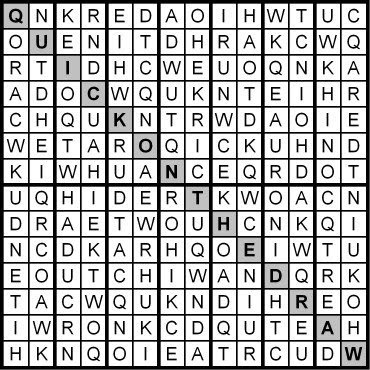 Here's your first three Word Sudoku puzzles, a classic 9x9, a "Hidden Word" 9x9, and a little more complicated hidden phrase puzzle using a 12x12 puzzle as its decoder. Please let me know what you think! Solutions tomorrow!